Tis the season for clutter. In your life, in your home, in your head! Ok…well, maybe not in yours, but it sure is in mine! I’m being very vulnerable here. I pride myself in being a really good housekeeper. Off and on I get someone to help me clean house for a while but it rarely lasts long because I actually don’t mind cleaning and I like it done to my satisfaction. However, lately I feel like my life is so full that cleaning has only come in short spurts…maybe just one small area at a time between projects, shopping, wrapping, teaching, mothering, grand-mothering, etc. Dan recently made a remark about an area under a cabinet in our foyer where the dust balls were laying a nice white carpet. I assured him it was a science experiment and I would get back to it in the near future. Yesterday I finished “putting on my face” at my make-up dresser and as I got up I gasped at the array of jewelry, hair tools, make-up, paper, pens, tissue (mostly used), and various other articles strewn all over the top. I teetered on whether to be depressed or burst out laughing before I rushed away to another activity. I chose laughter. My next activity was rushing to the Sanctuary to set up for an art group annual Christmas party. I needed to hurry to get everything done before people arrived. When they began to trickle in, I enlisted their help. I was so far behind in my usual preparations. However, instead of my usual “I’ve got it….You just relax!” answer to these eager helpers, I began to let go of being in control. Then something happened that really brightened my day. Well, several things really. It was our 6th annual Christmas party for the Sanctuary Sessions Art group. We had a delightful time creating together….about 20 women….and laughing, eating a pot-luck lunch full of calories and good cheer and playing a few Christmas games, including a rather chaotic and fun-filled wrapped ornament exchange. 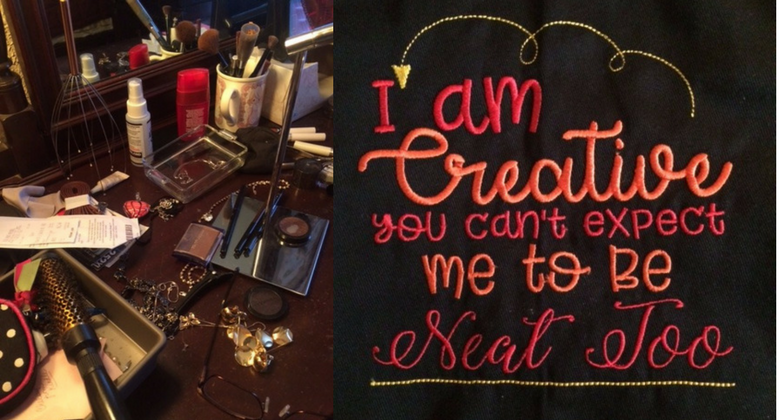 Among the many gifts and lovely compliments I received yesterday was an apron lovingly embroidered by Terri Day that says, “I am Creative. You can’t expect me to be neat too!” THAT’S when I decided to write this blog. How many years have I been my own worst task master at trying to be the BEST in every area of my life and falling short in my own eyes, leaving me frustrated and always feeling behind? I told someone recently that my house looked like someone had turned it upside down, shook it and then set it upright. That’s how I felt. Dan stopped me and said that by most people’s estimation my house always looked very orderly, put together and clean. At the time, I’ll admit to being a bit miffed when he said that. I wanted affirmation of my feelings and not a rebuff to what I was trying to portray. However, lately I have become more aware of how I really never feel like I have it “all together” and so I fret over all the things left undone. I’m very good at telling others to rest and let go. I’m very bad at listening to myself. I’m going to wear that apron daily just to remind myself that I don’t have to be perfect….not for myself and not for others. And, yes, that photo is my dresser top yesterday. I promise to clean it up soon! In the meantime, I’m not going to fret over it. What are you fretting about during this holiday season? So fitting. I was outlining ideas for a similar post earlier this week. While I don’t have that most awesome apron to wear, the sentiments are no less applicable. Beth, I think, perhaps, this is a common theme this time of year! Merry Christmas! Beth, this seems to be a common malady for a lot of us these days! Thanks for your comment! clothes that no longer fit…… do I believe I will “loose” the necessary weight or just donate them and move on? Oh, Betty…..another area I need to work on! I have a broad range of sizes….and unfortunately, I can hit most of those sizes in the span of a year!! Although I like being able to walk through the house, I value your creativity more than your neatness. I see what it does in bringing joy to your life.